Up to 1,000 jobs could be created if Ireland's national airline chooses Belfast as its new UK base. Aer Lingus is considering the International Airport at Aldergrove as its base in a major expansion. As well as jobs, the move would give people access to 15 new European routes and the Belfast International to Heathrow link would be re-instated. Lagan Valley MP Jeffrey Donaldson said it would be a substantial investment boost for Northern Ireland. "Aer Lingus is a respected carrier with its eye on growth opportunities in the United Kingdom; meanwhile the International Airport is growing its business at an impressive rate," he said. 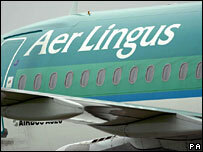 "The two could not be better suited as Aer Lingus seek to expand their United Kingdom operations."